RTC will be providing coverage of the NCAA Tournament from start to finish. Matt Patton (@mpatton08) is in Boston for the East Regional this weekend. Villanova doesn’t have to outshoot its opponents to win. Villanova won this game for two main reasons, and neither is a hallmark of this squad. First, the Wildcats dominated Texas Tech on the glass. They rebounded 37 percent of their own misses (20 offensive boards in all), extending their possessions and shortening the game. While they didn’t get all that many second-chance points, those rebounds forced the Red Raiders to expend more energy on defense with less time to mount a comeback. The second reason Jay Wright‘s team won today was because of their work defending the paint. Villanova had a good two-point defense this year (holding opponents to 49 percent shooting from the field), but their work in Boston this weekend was phenomenal. Wright’s team held Texas Tech to 7-of-24 shooting on layups despite foul trouble for much of the game for big man Omari Spellman. In fact, Texas Tech missed their last 10 layups of the game, covering the last 12 minutes of action (which was also when they were trying to mount an ultimately futile comeback). Villanova’s ball movement is probably unparalleled in college basketball. The threes didn’t fall for Villanova today, but the Wildcats space the floor better than any other team in college basketball. The whole rotation can shoot, so Jalen Brunson will frequently drive the ball inside as the other four players on the floor spread themselves around the perimeter. If Brunson’s pass to the corner or wing doesn’t find a wide-open shooter, the swing pass does. This exact scenario played out multiple times per game against West Virginia and Texas Tech this weekend. Brunson also doesn’t have to drive the ball to be successful. He posted up and backed down his Texas Tech defender multiple times today — most of the time he was looking for his own shot there, but he also had ample opportunity to pass out if anyone even hinted at helping off their man. Keenan Evans didn’t provide the spark Texas Tech needed from its best offensive player. Evans, who disclosed after the game that he has been playing for the last month with a broken big toe, wound up shooting 3-of-14 from the field, missing all four of his attempts from three. He was able to get to the line, which is another place the Red Raiders struggled, but when Texas Tech cut it to five points with five minutes left in the game, it seemed like the moment when Evans might step up. It’s hard to say how painful that injury was for him, but you can bet that it affected his explosiveness and balance with the ball throughout the postseason this year. Player of the Game. Eric Paschall finished with 12 points and 14 rebounds (six on the offensive ends) today, and was really the guy who stymied both of Texas Tech’s best opportunities to come back in the second half. When Brandone Francis hit a three-pointer to cut the deficit to five with six minutes remaining, it was Paschall who blocked Zach Smith’s subsequent layup that would have made it a one-possession game. With four minutes to play and the deficit again five points, it was Paschall who hauled in Brunson’s missed three while getting fouled. “It was like watching Magic Johnson back down.” — Chris Beard, tries to describe Jalen Brunson’s ability to create for himself in the post. “A couple of years ago we did a drill in the summer where we were defending the post […] and we were watching him, and coaches, all of us just said ‘Whoa, he’s the best post player we’ve seen in a long time with his footwork. '” — Jay Wright, describing his point guard Jalen Brunson’s post play. Sights and Sounds. 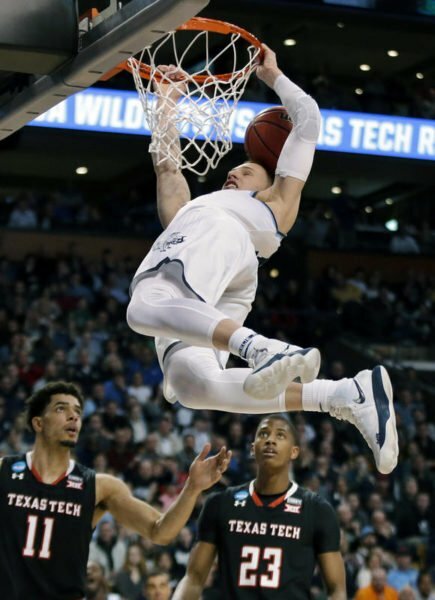 Paschall thwarted the first and last time Texas Tech cut the lead to five points, but Donte DiVincenzo‘s tip dunk with four and a half minutes left in the second half brought the house down. He silenced the Texas Tech crowd and kept the Red Raiders from a chance to get things down to a one-possession game. What’s Next. Villanova heads to San Antonio to take on the winner of Duke and Kansas in the late semifinal next week. The Wildcats match up pretty well with both teams — their shooting ability means Duke’s zone would be in a lot of trouble (especially with a week for Jay Wright to prepare for it). Kansas, on the other hand, hasn’t been an elite defensive team all year, which could spell trouble against a rested Villanova group. This entry was posted on Sunday, March 25th, 2018 at 4:09 pm by Matt Patton	and is filed under 2018 ncaa tournament, feature, rushed reactions. Tagged: Chris Beard, donte divincenzo, Eric Paschall, Jalen Brunson, jay wright, keenan evans, omari spellman, texas tech, villanova. You can follow any responses to this entry through the RSS 2.0 feed. You can leave a response, or trackback from your own site.